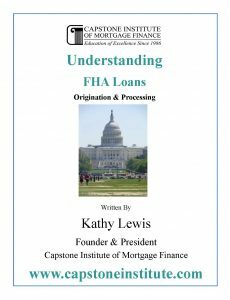 Trying to cover all the details in originating and processing FHA loans can be very intimidating unless you’re the nations most respected FHA trainer in the Country. When someone asks who’s the best FHA trainer in the USA; the reply is always Kathy Lewis. She understands how the information needs to be presented, and her training materials are unmatched. Please contact us if you’re in need of initial or recurrent training for your organization. We have experience in coordinating and delivering programs for groups from 15 to 35. Duration: 8 Hours Training & Testing / 3 months access to training. Testing: A repeatable final test is available at the conclusion of your training. Since 1986 Capstone Institute’s certificates of completion have set the industry mark for quality of training. Kathy’s training covers FHA down to the finest details. Originator or Processor; everyone needs to equally know the current FHA rules. Just one price and you’ll get all the correct training the first time. If it’s in our table of contents we’ll be covering it including practical exercises, current case studies, and testing. Beware of companies offering basic or beginner FHA training or advanced FHA. You either know the FHA rules, guidelines, policies and procedures or you don’t. Capstone Institute never offers courses that only get you halfway there. We don’t divide FHA loans into separate courses to charge higher tuition’s. The HUD 4000.1 handbook changes are included in your training and exercises. 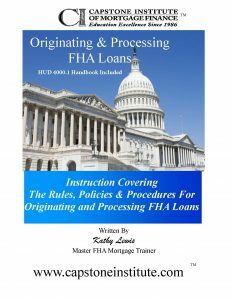 Your FHA training program covers both origination and processing. Originators can’t process their own loans but they do need to have an understanding of FHA guidelines, rules, formulas and other documentation required so the loan closes on time. As always Processors need to know everything. Instead of just reading a manual you’ll have the added befit of watching and listening as Kathy guides you through your FHA manual with practical exercises and case studies to enforce your learning experience. Our students tell us Kathy’s FHA origination and processing stories are what they really like the most because they’ll easy to remember and makes their learning easier.